After all these months, iPhone 5 is finally reaching to Malaysia. And yes! The iPhone 5 is arriving on the best network - Celcom! 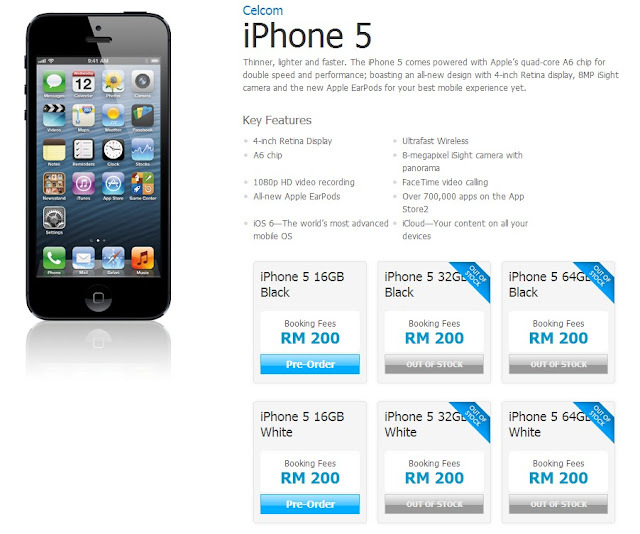 Thanks to Celcom, with only RM 200 deposit, you can pre-order and secure iPhone 5 without afraid it is out of stock once iPhone 5 is launched. In other words, you get invited to the launch to be one of the first in Malaysia to own the iPhone 5. Celcom has a history of having the most competitive iPhone 5 price and package among all telcos. Just a simple fact like that, I am excited to see iPhone 5 plans with Celcom. I am pretty sure it will be an interesting iPhone 5 plan. Celcom offers the best network quality, including messaging, voice calls, video callings. surfing Internet, reply emails and etc. Celcom gives the richest web and video streaming experience with its stable connection. Here's are some hypes you may want to know about iPhone 5.
iPhone 5 is running on the latest iOS6 with A6 chip. It helps to improve the performance and graphics up to twice as fast with more battery life to spare. iPhone 5 has wide 4" Retina display. Besides, it has wider screen display and more vibrant colors. iPhone 5 has 8MP camera with new Panorama feature. iPhone 5 has built-in Siri as personal mobile assistant, and it understands more questions, allowing it to answer more questions. iPhone 5 is available in black and white colors with 16GB, 32GB or 64GB storage. While waiting iPhone 5 to be released, head on to Celcom at www.celcom.com.my for Celcom First plan. Do remember to check out their soon-to-be-released Celcom plans for iPhone 5. Be fast yo people, before the pre-order comes to an end. Head on to this site for pre-order.